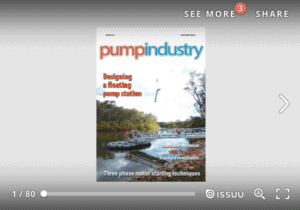 It can be common for pumps to operate at low flow. This is inevitable in many cases, as the nature of many process operations place varying demands upon the equipment. Whilst operating at low flow, a machine is under much greater duress than at most other operating flows. 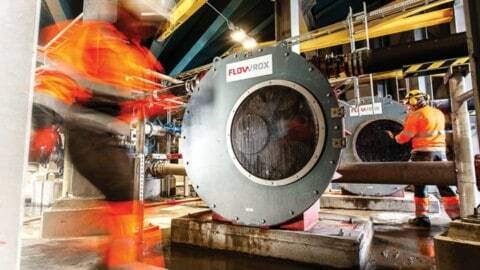 To understand why operating at extreme low flows can cause pump problems, it is instructive to analyse the nature of the flow through the machine. 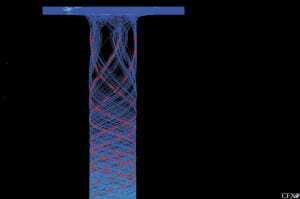 Using computational fluid dynamics, Hydro Australia has been able to model this flow picture. By truly understanding the nature of the flow regime Hydro Inc Engineers have been able to re-design and refine equipment for wider operating regimes and greater mean time between failures. The days have long passed where pump vibrations were viewed as largely a matter of mechanical balance. Nowadays, we recognise that, even if a pump has near perfect mechanical balance, it will still exhibit remnant vibrations. The intensity of this remnant vibration turns out to be flow related, with a minimum at or around best efficiency point. Clearly the hydraulic design of the pump has some significance in its vibration behaviour. Vibration at “one times” shaft rotational frequency is frequently ascribed to driver misalignment, or mechanical balance. However, this can also be caused by the impeller if it is machined eccentric to its hydraulic centre. The impeller behaves like a hydraulic cam while in the pump, even though it may be in near perfect mechanical balance in air. See Figure 1. Figure 1. Hydraulic cam causing high 1x vibration. From a hydraulic design standpoint, vibrations at vane pass frequency are always inherent, due to the way impellers generate head. Each vane had a pressure differential between the top and under side of the van. This pressure differential results in a velocity difference over both surfaces of the vane. This difference propagates through the passage out into the collector. Thus the collector, and anything connected to it, will experience a fluctuating velocity field once per impeller blade pitch. These result from the turbulent ‘wake’ generated at the trailing edge of the blade, which is fuelled by the two different velocity streams mixing out. See Figure 2. Figure 2. Varying velocity experienced by diffuser. At partial capacity this flow picture greatly deteriorates, as shown in Figure 3. Each passage is filled with slow moving fluid. The diffuser passages are stalled and the velocity is heavily time dependent. Operated in this condition it is easy to see how vibration and heat can become a problem for pumps reliability. Figure 3. Complex nature of the flow regime at low capacity. This phenomenon is always present within a pump operating at low capacity, and always contributes to the vibration level. 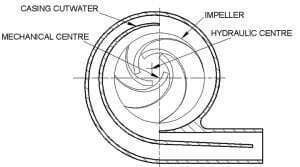 High-energy liquid is expelled from the impeller eye. This expelled liquid dominates the suction passage, occupying the two-thirds of the flow area from the pipe outer diameter downwards towards the channel centreline (see Figure 4). The extent that the expelled liquid fills the suction channel remains unchanged with distance from the impeller. This flow spirals helically down the periphery of the suction pipe. Figure 4. Internal core of spiralling fluid in suction channel. Each impeller blade generates individual streams. The tangential velocity imposed on the regime by the impeller dominates the flow causing the helical spiral angle to be approximately equal to the blade inlet angle. This angle does not diminish with distance from the impeller implying that both the tangential and axial components of the velocity decay proportionally to maintain this angle. The inner third of the suction channel area contains a spiralling core of slower moving fluid. 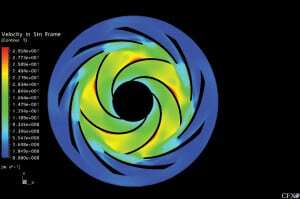 Viscous effects transmit tangential energy from the high-energy peripheral flow and drive this core in a helical spiral counter to the direction of pump rotation. Flow is dominated by the axial component of the velocity and tangential forces exerted by the peripheral flow cause the inner helical flow angle to be approximately double the outer angle. 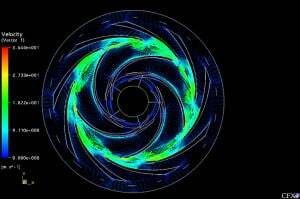 Again the helical spiral angle remains constant. See Figure 5. 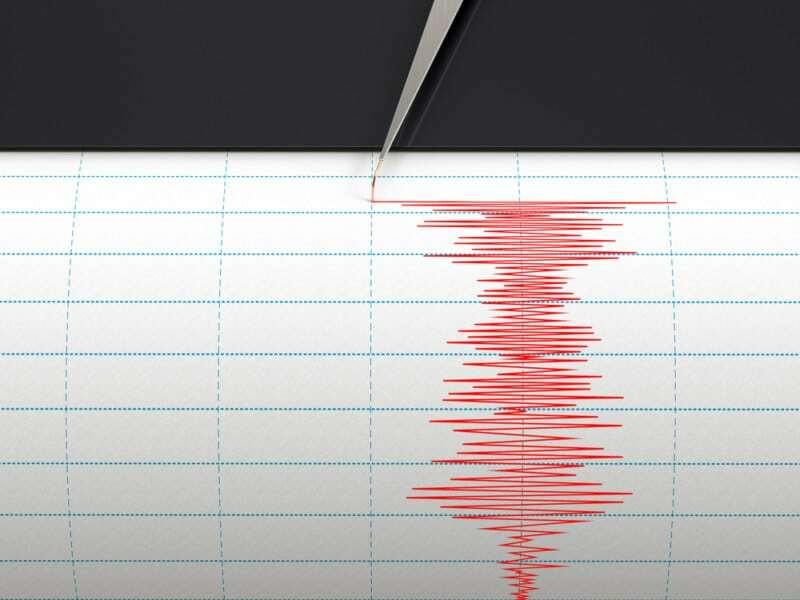 Whilst these velocity streams are not responsible in the computational analysis for a vibration component, this cannot be said in a real situation. Pump suction and piping designs contain discontinuities such as splitters, elbows and reducers. The velocity streams impacting on these features contribute to the vane pass frequency vibration. Figure 5. Helical spiralling inlet backflow at suction duct periphery. 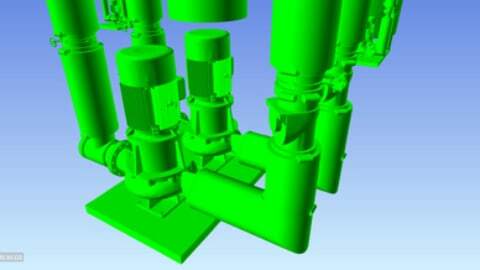 Being able to visualise the nature of the flow with a centrifugal pump allows a greater understanding of how these flow impact on the reliability of the equipment. Vibration is no longer viewed as merely a function of the mechanical balance but is also influenced by the design of the bladed components, the operating philosophy and the precision of the build of the pump. 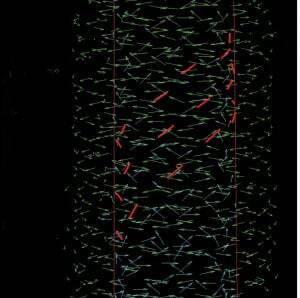 By using advanced computational techniques it is possible to refine and manage these contributing factors to minimise hydraulically generated vibration. Dr Gary Dyson is the Managing Director of Hydro Global Engineering Services, based in the United Kingdom and Chandra Verma is the Chief Design Engineer for Hydro Australia, based in Morwell, Victoria.